A series of imidazole based platinum(II) complexes were synthesised and evaluated for their cytotoxicity in HCT-116 cancer cell line, known for being partially resistant to cisplatin but sensitive to oxaliplatin. Lipophilicity was modulated by introducing differently long saturated and unsaturated chains at the N1 of the imidazole moiety. Pt-I displayed the higher cytotoxic effect achieving a IC50 = 38.0 ± 14.1 μM, comparable to the oxaliplatin value. 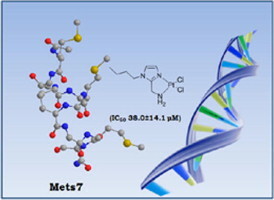 The interaction between the imidazole platinum(II) complexes and the octapeptide called Mets7, the methionine-rich motif mimicking the N-terminal domain of the yCtr-1, was evaluated in order to have a major insight of the uptake and the eventual resistance mechanisms for the so-synthesised novel platinum compounds.